FreeRange 2005 Bordeaux Selected in Judging! Manchester, MA – JuiceBox Wine Company’s 2005 FreeRange Red Bordeaux has been selected as one of the best affordable Bordeaux wines in 2007. The 2005 FreeRange Red Bordeaux was selected in a blind tasting by an independent jury of recognized experts from among hundreds of Bordeaux wines selling for the equivalent of $8 to $25 per bottle. JuiceBox’s 2005 Red Bordeaux is a blend of 60% Merlot, 30% Cabernet Sauvignon and 10% Cabernet Franc and is packaged in an innovative three liter bag-in-box. The2005 FreeRange Red Bordeaux has been added to the 2007 list of “Today’s Bordeaux: 100 Classic, Contemporary, Affordable Wines”. “We’re thrilled that our Red Bordeaux has been recognized as an outstanding wine and particularly since it was the only boxed wine selected in a blind tasting against hundreds of other bottled wines,” indicated Jonathan Barry, one of JuiceBox Wine Company’s founders. “Not only is this great wine for a great value, but it comes our convenient 4BottleBoxTM, which holds the equivalent of four 750ml bottles of wine and keeps the wine fresh for six weeks after opening,” Barry added. The 2007 jury for Today’s Bordeaux consisted of Paul Chaconas, Bordeaux Category Director for Total Wines & More, the nation’s largest chain of fine wine stores; Cat Silirie, Wine Director for Boston’s No.9 Park restaurant group; and Mark Oldman, author of the best selling Mark Oldman’s Guide to Outsmarting Wne. The Today’s Bordeaux program is sponsored by the Conseil Interprofessionnel du Vin de Bordeaux (CIVB), which represents more than 10,000 Bordeaux producers and 400 négociants. 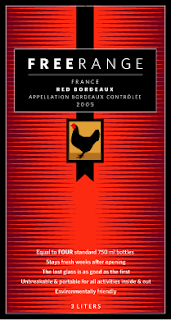 JuiceBox’s 2005 FreeRange Red Bordeaux will be showcased along with other Bordeaux wines recognized in Today’s Bordeaux in trade and media tastings in May in Washington, DC, New York City, and Boston.